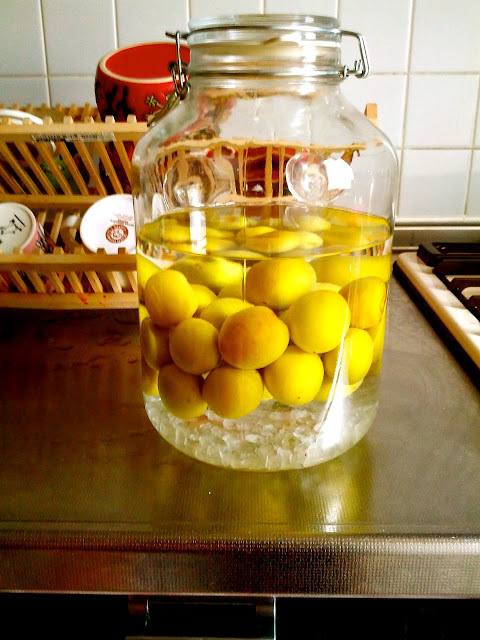 It's Umeshu (plum wine) time in Japan and all good housewives are rushing to the supermarkets to buy plums, alcohol and ice sugar (floating on the bottom of the jar). I followed the trend mainly because I love plum wine and not because I'm a good housewife. Easy and cheap to make but 5 to 6 months to wait before it turn into a really delicious drink. I hope it turns out well. I never knew about making plum wine. It looks really pretty!